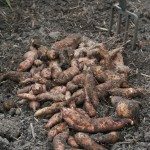 So you’ve decided to grow some sweet potatoes in the garden and now you need information about when and how to harvest sweet potatoes once they’ve matured. Read on to learn more. When to harvest sweet potatoes depends largely on the seasonal growing. If the growing season has been good with adequate water and sunshine, harvesting sweet potatoes should begin about 100-110 days after planting depending on the variety. A good rule of thumb is to watch for the first signs of yellowing leaves. Usually this occurs in late September or early October before the first frost. Many people think frost won’t affect your harvest. Sweet potatoes are well insulated underground, after all. The truth is once those vines blacken with frost bite, the answer to when to dig sweet potatoes becomes — Right Now! If you can’t harvest sweet potatoes right away, cut those dead vines off at the ground so the decay doesn’t pass to the tubers below. This will buy you a few more days for harvesting sweet potatoes. Remember, these tender roots freeze at 30 F. (-1 C.) and can be injured at 45 F. (7 C.). When deciding when to harvest sweet potatoes, choose a cloudy day if possible. The thin skins of the newly dug potatoes are susceptible to sunscald. This can open the way for infection to enter the tubers and cause damage during storage. If you must harvest sweet potatoes on a sunny day, move the roots to a shaded spot as quickly as possible or cover them with a tarp. How to harvest sweet potatoes is every bit as important as when to harvest. Sweet potatoes have delicate skin that is easily bruised or broken. Be sure you sink your garden fork far enough out from the plants to avoid striking the tender roots. Don’t toss the freed potatoes into your carrying container. Place them carefully. A potato that has been damaged by cuts and bruises will leak a milky juice over the injury. Some people believe this juice seals the injury. It doesn’t. Minor scrapes will heal during the drying process, but the best practice when harvesting sweet potatoes is to set deeply cut roots aside to be eaten first. Washing the newly dug roots is another common mistake made by many home gardeners when harvesting sweet potatoes. 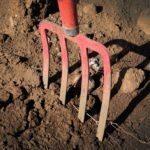 Newly dug roots should be handled as little as possible and moisture should never be added. When we talk about how to harvest sweet potatoes, it’s important to note that it’s more than just knowing when to dig. Sweet potatoes must be cured after harvest and before they are stored. After digging, allow the roots to dry for two to three hours. Don’t leave them out overnight where cooler temperatures and moisture can damage them. Once the surface is dry, move them to a warm, dry, well ventilated place for 10-14 days. This will not only allow the skins to toughen, but will increase the sugar content. You’ll notice the color change to a deeper orange after several days. Knowing how to harvest sweet potatoes properly can increase your storable yield as well as the pleasure derived from enjoying your harvest all winter long.